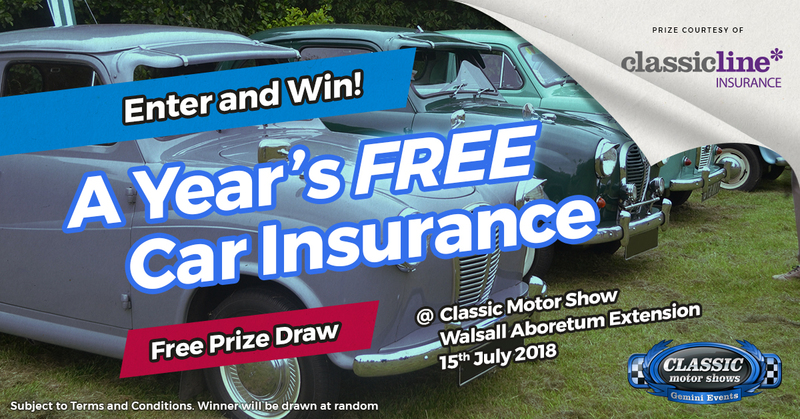 Visitors to the ClassicLine Insurance sponsored Walsall Classic Motor Show, now celebrating its 28th year, have the chance to win a year’s free car insurance. The prize draw will be one of many highlights on Sunday 15th July which will see up to 500 vehicles on display, including pre and post war classics and commercial vehicles of yesteryear, at the Walsall Arboretum Extension. There is also an interactive arena providing entertainment all day, including the famous decibel duel, plus autojumble and trade stands. The Walsall Classic Motor Show is celebrating its 28th year and has firmly established itself as an annual highlight in the West Midlands motoring calendar. Ian Fray, managing director at ClassicLine Insurance, said: “ClassicLine Insurance is delighted to be this year’s headline sponsor of the popular motoring event and to mark the occasion we are giving away a year’s free car insurance worth up to £250 to one lucky winner. The action-packed day, which runs from 10am to 4pm, is organised by Gemini Events. There is free car parking for the Walsall Classic Motor Show and dogs are allowed on leads. For more information, including ticket prices, visit the Gemini Events website.